The Higgins PT boats initially had 10 funnel ventilators as standard equipment plus powered fan ventilation in the engine room. Ventilation was critical not only for the humans inhabiting the below deck space, but also for exhausting carbon monoxide and gasoline vapors that might accumulate in unventilated spaces. In later boats, after the turrets were relocated aft, two of the tall funnel ventilators were removed and a smaller funnel vent added to the engine room hatch. Funnel ventilators under construction. The larger vents were built up using half inch plastic water pipe as a base and adding shaped card stock for the upper part of the vent. These will probably be used for actual ventilation on the model, to provide cooling for the electric motors. The smaller vents are made similarly but start with 3/8″ copper pipe as the base. 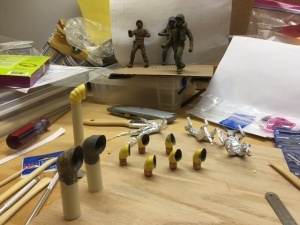 In this photo you can see some crew members being made from Sculpy clay, and several copper wire/aluminum foil armatures for more crew on the bench. 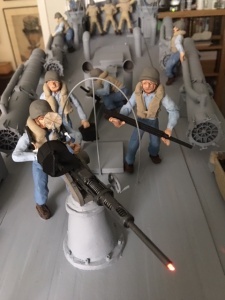 The boat being modeled has the standard two turrets mounting twin Browning 50 caliber machine guns and a 20 mm Oerlikon auto cannon on the after deck. 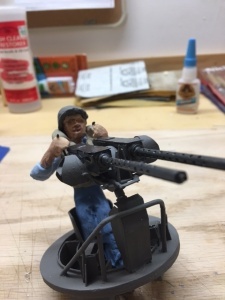 For this model, all the guns are constructed with optical fiber in the barrels to simulate gun flashes when firing. The fiber will be illuminated with LED lights controlled with Arduino modules/sketches. 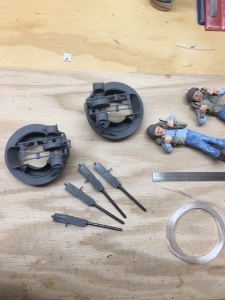 The gun barrels for the Brownings were made up from 1/16″ brass tubing for the barrels and polystyrene tubing for the cooling sleeves. 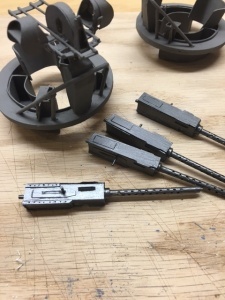 The holes in the cooling sleeve were drilled by hand using a jig made up from a 1/4″ hex nut on threaded rod as a jig/guide to spacing the holes around the tubing. The brass tubing for the barrels will hold 1 mm optical fibre for the gun flashes. 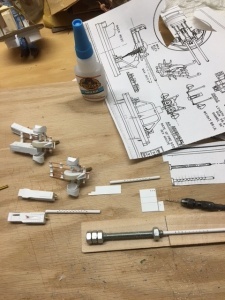 This snapshot shows the guns near completion with the gun cradle and turret mount in the background. The ammunition cans and belt guides are also in place. Details were made up from polystyrene sheet plastic, brass wire, and brass sheet stock. The guns ready to be mounted in cradles and the optical fibre installed. The two “gunners” are ready to man their stations. This gun will be installed on the after deck, behind the engine access hatch. See part 2 for more information.